During my first job out of college, I went through a major lentil obsession. I packed the same lentil recipe for lunch almost every single day, and somehow didn’t get tired of the monotony until several months later. What kept me so loyal to these little legumes was not only their delicious taste and texture, but also that they kept me so full throughout the afternoon – there’s nothing worse that having your stomach growl throughout a slow day at work! I still love lentils, but have started to branch out in how I cook them. 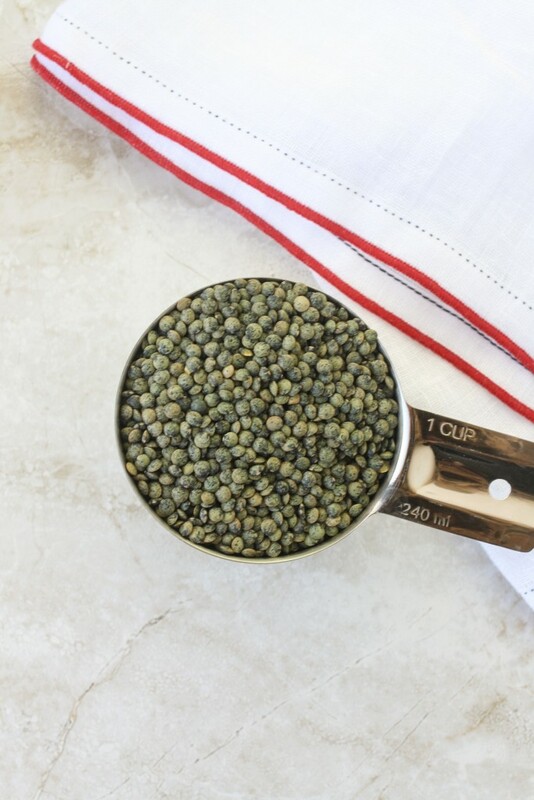 Lentils are such a wonderful food for vegetarians especially, as they are packed with protein, iron and fiber. Red lentils are fantastic in Indian dishes, while French (also known as Puy) lentils are wonderful in things like warm salads and soups. 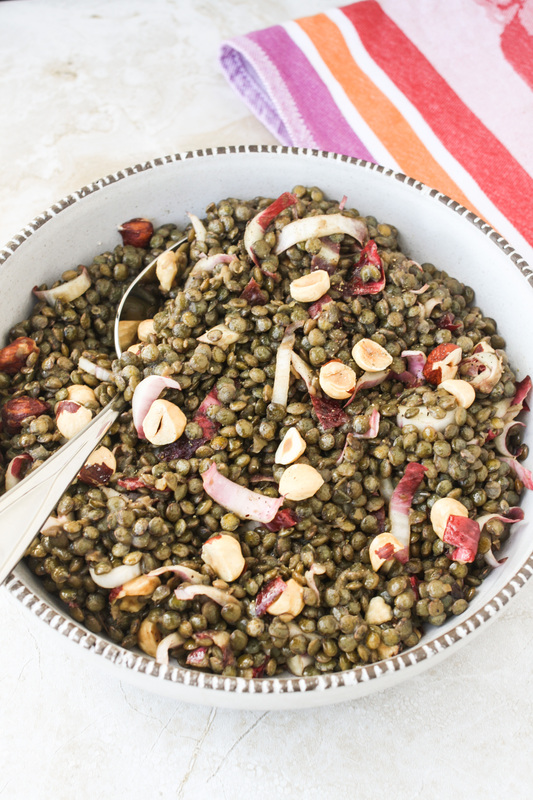 This French lentil salad has quickly become one of my favorite ways to enjoy lentils. This salad is one of the easiest recipes you’ll ever make. You simply cook the lentils, whip up the dressing, and add the chopped hazelnuts and thinly sliced endive. I love making a big batch of this and then bringing it into work, as it packs quite well and can be served hot or cold. Its got a wonderful combination of flavors, too: the endive adds a nice subtle bitterness, which is balanced out by the sweet hazelnuts and honey dressing. 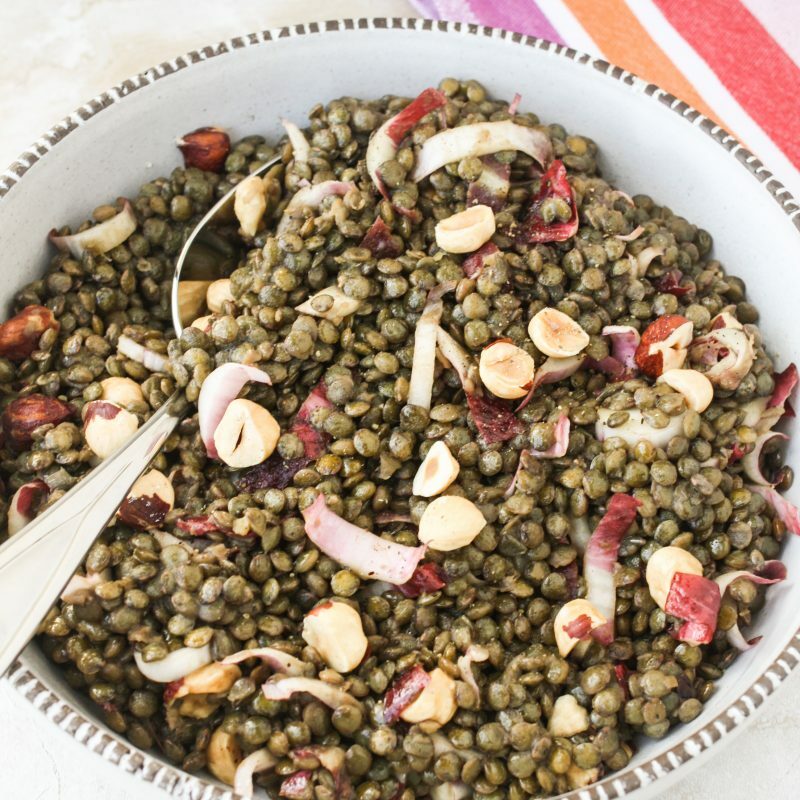 The soft lentils soak up all of the lovely flavors of the dressing and are the perfect contrast to the crunchy endive and hazelnuts. The salad goes to show that it’s often the simplest recipes we end up loving the most! A wonderfully healthy and simple lentil salad, with refreshing endive and sweet hazelnuts. Add the lentils and water to a medium pot. Cover the pot and cook on medium until all of the water has absorbed, about 15-20 minutes. The lentils should be soft but still have their shape. In the meantime, whisk the dressing ingredients together in a small bowl. Once the lentils are finished, add the hazelnuts, endive and dressing and toss well. Season with additional salt and pepper, and serve either warm or cold. Note: the hazelnut oil makes this dressing really stand out. It has a light nutty flavor that pairs so well with the lentils. If you cannot find it, olive oil is fine to use instead. Lentil salads are hard to not love. 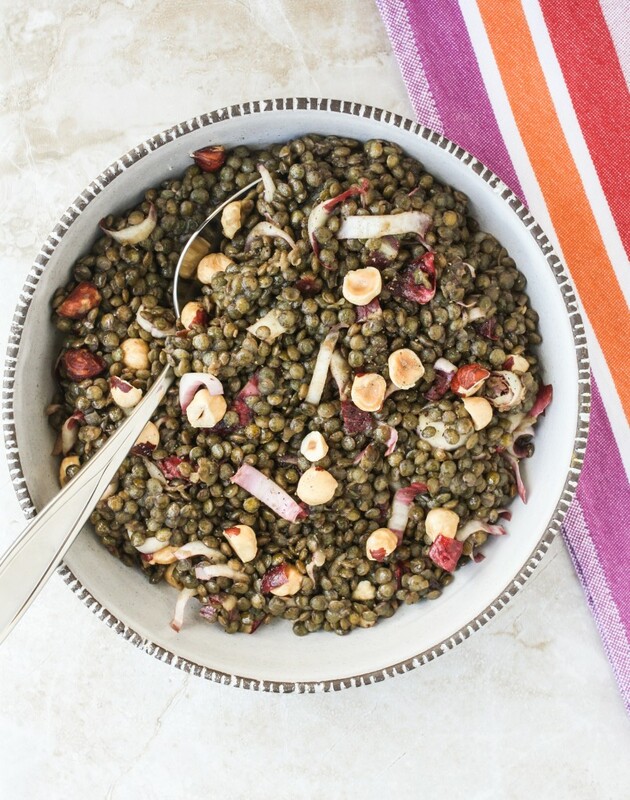 I love making a big batch of lentil salads to have on hand all week too. And I like that you use sherry vinegar and hazelnuts in your salad. Must remember that! I make big batches too, Katie – they hold up so well for several days, which is not always the case with other leftovers! I think you’ll love the hazelnuts, since they add a really nice earthy sweetness to the dish! I love lentil salads and this looks like a great version. Like you, if I find a recipe I like I can definitely eat the same thing for a couple of days in a row with no problem. Love how simple this is to throw together, Julia! Thank you, Geraldine! It’s great to have simple recipes on hand for busy days. And call me crazy, but I love leftovers! Thanks, Medha! You’re right, lentil salads are much more interesting than standard salads – but they are still so easy to make. A great combination! Thank you, Ceara! I hope you enjoy it! this is just the kind of easy meal i love. and i’m sure the leftovers are great too. i fell in love with hazelnut oil after picking some up at trader joe’s. so wonderful. have you used it in baking? i just made a carrot cake with it and was superb! Love, love, love the simple yet elegant flavors you’ve combined in this salad, Julia! Bitter endive balanced with honey, the crunch of the hazelnuts against the lentils; so earthy are yes, filling! I can see why you’d want to make this and take it to work throughout the week! This will definitely help curb my 3:00 hunger pangs! Thank you Julia! Hazelnut oil? How is it I haven’t tried this yet? The textures in this recipe complement each other nicely–crunchy endive and chewy lentils…yum. I promise to try some if you’ll make a batch soon! They now have hazelnut oil at Trader Joe’s! I think you would love it – it has a light nutty flavor and the most wonderful smell. I will make this dish for you soon! I loveeee lentils! And am on quite the kick again right now! haha This salad looks wonderful – so simple yet tasty! !